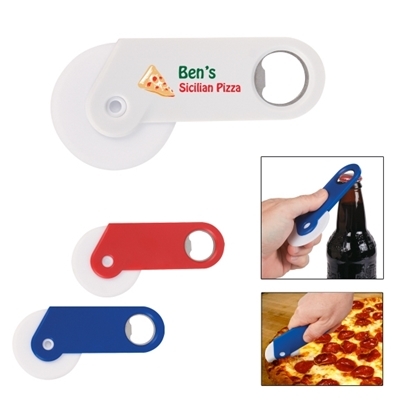 Slice into your hot marketing campaign with this pizza cutter with bottle opener! Meeting all FDA requirements, this BPA free item can pull double duty at your next tailgate or party. Offered with four different color options, this useful item features a pizza cutter on one side and a bottle opener on the other. Hand out this eco-friendly product as a fun promotional product, especially with an imprint of your logo or advertising message on the handle. Hand wash recommended. Choose this as your next stand out giveaway! Mypromotionalpens.com offers the largest and best priced selection in Promotional Pizza Accessories. We will price compete and we won't be under sold. Let our graphic designers make your personalized Pizza Accessories standout above the crowd at no charge. We won't stop until you are completely satisfied with your custom Pizza Accessories art proof.Use category search filters on your left to help narrow your search to find exactly what you are looking for.